After months of speculation, the mid-sized warrior in Samsung's Note family is finally official. The aptly named Galaxy Note 8.0 sports an 8-inch 1280x800 pixels display clocking 189ppi pixel density - a tad higher than the direct competitor Apple's iPad mini. The tablet is driven by a 1.6 GHz Exynos 4 Quad ARM Cortex-A9 processor, and the slate has a 5 MP camera on the back, accompanied by a 1.3 MP frontal cam for video chat. Memorywise Samsung has outfitted the Galaxy Note 8.0 with 2 GB of RAM and 16/32 GB of storage, as well as a microSD card for memory expansion. The mid-sized Note warrior is powered by a fairly generous 4, 600 mAh battery unit. The real added value, however, is the presence of the S Pen stylus tucked neatly in the Galaxy Note 8.0 silo, which is more advanced than even what we have on the Note II handset, as it allows you to manage the physical home and back keys (yes, we have those on the tablet) without even touching them. Add this to the usual barrage of useful apps and tricks like S Note and Air View that let you use the stylus in many ways for overview, doodling, handwriting, cropping and so on, and the Galaxy Note 8.0 becomes a unique proposition in the sea of Android tablets. Speaking of the green robot, it is present here with its 4.1.2 Jelly Bean offspring, but Samsung has blanketed it with its trademark features like the Dual View multi-window mode, Pop Up Play, Smart Stay and Page Buddy, which here intuitively launches your last S Note homescreen. Samsung also throws in Flipboard preinstalled, letting you preview news by hovering over with the stylus, as well as an year worth of Awesome Note as a freebie. The dedicated e-reader mode puts the LCD settings in the appropriate regime for easy on the eyes reading, and works with 3rd party apps, and there is also a Peel-based Smart Remote app, which is an interactive TV guide and remote control at once, utilizing the tablet's IR blaster. The global launch of the Samsung Galaxy Note 8.0 is slated for the second quarter in Europe and Asia at the beginning with HSPA+ version available, too, from which you can make phone calls, while the eventual LTE one and other US plans are bound to be disclosed at a later date, along with the tablet's pricing details. SEOUL, Korea [February 24, 2011] – Samsung Electronics Co., Ltd, a global leader in digital media and digital convergence technologies, today announced the launch of the 8 inch tablet, the GALAXY Note 8.0; a new era of intelligent Note technology set to re-ignite the mid-size tablet category that Samsung established in 2010. Providing unrivalled multimedia performance within a compact one-hand-grip screen, the GALAXY Note 8.0 has the power and advanced technology to evolve the tablet experience and ensure you achieve new levels of efficient multi-tasking while benefitting from superb voice call functionality*. Furthermore, the intelligent S Pen brings together the latest innovation and the ease of using a traditional pen and paper; creating a sophisticated mobile experience that will enhance life on the go. 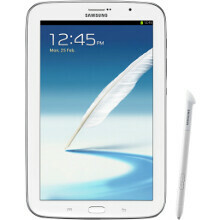 “Back in 2010 the launch of the first Samsung GALAXY Tab with 7 inch screen opened a new chapter in the mobile industry. Now almost three years later, Samsung continues to evolve the sector that meets the demands of modern life.” said JK Shin, President of the IT & Mobile Communications Division at Samsung Electronics. “The GALAXY Note 8.0 breaths fresh life into the category as it delivers the perfect fusion of portability and everyday productivity - the result is a pioneering, pocket-sized solution that enhances and enriches our everyday lives, whether at work or play,” added Shin. At the core of the GALAXY Note 8.0’s innovative solutions are beneficial functions, including multi-window options to split the portable 8inch screen and allow optimal access to a number of live applications; a new generation of Samsung’s intelligent S Pen with advanced usability; access to a suite of S Note templates and tools that allow you to create, edit, manage and share everyday documents; the Samsung “reading mode” technology to enjoy e books with optimized resolution, video and voice calls*. In addition, a suite of exciting new content and services are pre-loaded for users at no additional cost including, for the very first time on Samsung GALAXY tablet, the innovative Flipboard, and Awesome Note. Slim and compact enough to become the perfect on-the-go work and play companion, the GALAXY Note 8.0 brings powerful performance and functionality to support even the most demanding of lifestyles. Designed to store and manage your personal and professional data efficiently, the new era device gives users the perfect pocket-sized hands-on organizational tool. Practical S Note templates and S Planner feature help to manage everyday tasks, including meeting notes, to-do lists and even personal diary entries. All content can be entered and updated with the finest of detail thanks to the evolution of the intelligent Samsung S Pen. Enhanced precision is offered with Handwriting-to-Text conversion and advanced Productivity Tools that support formula and shape recognition are now available at the touch of your S Pen. GALAXY Note 8.0 is packed with pre-loaded content and apps specifically for the value maximizing, mass multimedia consumer. Upgraded Chat-On provides easy instant messaging and group chatting in multiple formats – images, video, voice, contacts – for simple, enjoyable communication. Awesome Note, an integrated application that is introduced in android tablet for the first time with NOTE 8.0, is capable of unlimited note-taking uses including Memo, Diary and Must-remember lists. With Flipboard, your news, social network and other feeds come together in one stylish, flippable format so you can enjoy all your news and life’s great moments in one place. Flipboard developed a customized version of its application exclusively for Samsung that allows users to take the S Pen’s hover feature and preview article headers beneath Flipboard's main screen tiles. Finally, Smart Remote, gives you a universal remote control and electronic programming guide allowing you to manage TV and video watching seamlessly. Optimized to aid personalized creativity, the Samsung S Pen has evolved to increase everyday usability and enhance creation expression. Embedded within the tablet, the S Pen is an extension of the GALAXY Note 8.0. Removing the S Pen from the device will automatically launch innovative features such as Pen Detection that will suggest adapted menus that it thinks you’ll need and Page Buddy, a feature that will intuitively activate your most recently adapted S Note home screen. In addition, for the very first time in GALAXY NOTE category, you can use S Pen to control the physical menu/back buttons on the device with WACOM technology. Creative multi-tasking with the GALAXY Note 8.0 is effortless due to innovative Dual View feature, two multi window options that seamlessly allow you to facilitate multi-screen usage. Dual View’s split screen accommodates optimal operation of different apps, such as launching the S Note on the web browser screen and allowing content to be resized, dragged and dropped as required. Multi-tasking is extended to phone calls*. Pop Up Note allows you to access S Note at any time to keep track of key actions and Pop Up Video ensures you can keep surfing the web whilst chatting – content windows can be easily resized by pinching to enlarge or reduce. Packed with features to engage, entertain and excite, the GALAXY Note 8.0 supports your practical everyday needs. Reading Mode transforms the GALAXY Note 8.0 into an e-Book reader, provides the optimal reading conditions to ensure you can curl up and enjoy a good book. You can even turn it into a universal remote control with Smart Remote, to seamlessly manage TVs, set-up boxes, DVD & Blu-ray players. no. i want tab3 with full HD under 400 dollars. nexus 7 is still the winner. stop complaining mate! Nexus 7 is a great tab but this is a different product altogether...its a Note! The sheer productivity and fun you can have with this is way beyond Nexus 7 and this starts at US $350! so whats the problem? And i dont get all the fuss about screen-res...people have laptops and desktops with 1080p screens and dont complain so I dont see why a 1280x800res isnt good enough for an 8 inche screen? This is definitely a new era of portability and every day productivity. That new Spen will definitely prove it's greatness here on the Galaxy Note 8 but also on the upcoming Galaxy Note 3 in October 2013. Can't wait for both. where is the led flash....????? it's a failure!! Discourages people from using their tablet to take pictures. Smart decision. Not a failure. not for me..i only use the back camera not the front..
Don't fall in the beauty.... go for functionality... And my doubt why are you confusing between tablet and smartphone??? Actually he is talking about two tablets. The Galaxy Note 8 by Samsung and the Xperia Tablet Z by Sony. Hey, here's my advice, really it depends what you want, the Note will undoubtedly be better for travel/transportation, and also perhaps reading books and slightly better for some (Samsung apps) productivity. However, the Xperia Tab Z is gonna be better for multimedia, so films, music, gaming etc etc, it will also be superior for web browsing and has a better build quality and design - as such, expect the tablet Z to cost a tad more, although I can't see the note 8.0 being cheap despite it being in the 7-8" category. p.s. the remote function on the XTZ works with all TV's - my old Tablet S' remote worked with my Grundig (yes, who are they!?) TV :) Hope this helps! Samsung now have smartphones and tablets in any size you ask for. ....and they all have the same (or very similar) name(s). Does anyone else think this creates a bit of confusion? Those of us that follow this stuff closely know whats up, but I have a feeling your average consumer will be very confused by this trend. Based on looks and specs I can say that this isn't a bad tablet. But the price is what will make it or break it. i hate that they've gone back to the "let's make a giant phone" philosophy. tablet Z is on that price range? if thats tru then i might get tablet Z :D im thinking of not8 not because of the brand! i want Spne and Touchwiz capabilities. There is a hands on video of it on android central YouTube channel.